I have great pleasure to part with my experiences on Assistive Devices, with many I am closely related since 1960. Till 1980s definition spelled that appliances could be worn on body like orthosis or prosthesis. Later, they became walking devices. Aids are ambulatory like wheel chair, tricycle etc. ; a walker is mini movable version of parallel bars. A Seat-lift chair underlines a device in transfer activities and so a sliding board. We have used for weak/ painful hand, the forearm-resting walker open in front and with a seat behind. Stair-climbing walker is available, now. Body Weight Support systems or a treadmill are also walking aids but cannot be carried along with. Hearing aid is the connotation in vogue though it is worn (appliance) and so the looking glasses. ADL aids and writing aids were included under self care devices, a concept popularised by occupational therapists, though a hand splint was an appliance. Assistive technology devices classification is based upon the World Health Organization's, ICF, Disability and Health. Exercises, and various techniques fall under assistive devices. Aids and appliances belonged to an individual and carried along with. This is not the case with ramp or removal of architectural barriers at home, under ATDs. A mobile phone is an aid likewise a warning system for safety of a disabled is an aid; a raised toilet seat is an aid and AD or ATD contain them all. We have a dedicated team of authors that has parted information and valuable experiences. I have touched some remaining salient points. Training in upper limb appliances is more demanding due to loss of hand, a highly specialised sensorimotor organ. It is seen that mechanical hands were improvised with myoelectric hands. The technology is focused on microprocessors for hand control. Further, accelerometers and gyroscopes sense the angle and speed of the user's movement and would provide some sensory feel. But it is in order that we trace the information from posterity to know the progress. I may quote a stanza from Rugveda, that a woman warrior named Vishpalaa lost her lower limb during war. She resumed next day wearing an Iron limb (>5000BC-8000 BC)! This is the most ancient reference of a prosthesis historically while also a precursor of immediate post-surgical prosthesis fitted. Development took off after World Wars I and II. Fortunately it is continued in peace-time. Axillary crutch is advancement over a single stick. A wooden rocker bottom foot substitutes heel-toe action efficiently. I saw some rural AK amputees rested the stump on a horizontal bar attached to a single axillary crutch. During Fellowship programme, I was posted in Rehabilitation Institute of Montreal where research on Myoelectric hand was under progress, in 1968, after a Russian Hand. I was trained under Prof Basmajian in EMG. His Single Motor Unit training concept is used in Myoelectric hand for getting graded movements. I was trained in clinical biomechanics under Colin MacLaurin an aeronautical engineer who designed appliances for the thalidomide babies. He was awarded D.Sc. under Faculty of Medicine at Queens University Canada. I had training under James Foort in Prosthetic Biomechanics. He preferred that I follow ‘do-it-yourself’ way of learning with which I was familiar since I had spent 4 months in P&O workshop to orient with workshop basic skills prior to my job. Foort allowed his personal Lab to fabricate as many sockets in extra-office hours. Eventually, I was awarded a ‘Certificate in Below Knee Prosthetics’. MacLaurin and Foort insisted that I stay with Leigh Wilson in San Francisco during APTA Conference. My wife and I had to honour it. Leigh was an AK amputee turned in to a prosthetist and was attached to Biomechnics Lab. Berkeley. I met Prof. Inman, physiologist Ralston and Professor Radcliff of mechanical engineering. MacLaurin’s design of hip disarticulation prosthesis is a marvel simplest, effective, based on alignment of hip forward, and knee backward to the line of weight bearing, stabilising the prosthesis without mechanical-lock. Active forward pelvic motion breaks stability; the swing is initiated by a hip rubber bumper and hip flexion control strap. Wilson contributed by introducing an air-cushion socket that helped in some end-loading and offered better grip. In 1989 I met Dr Sydney Fishman, PhD, a prosthetist, with New York Uinversity, in WHO Workshop on Orthopaedic Technologies in Dakar, West Africa. A thermoplastic AK socket was demonstrated there; Fishman commented that in USA it was used as a check-socket before FRP socket. This luxury of 2 sockets is not financially feasible in developing countries. I demonstrated a thermoplastic PTB orthosis from our national project, functionally effective. Thanks to Foort who was a chemical engineer credited for introducing plastics in prosthetics in 1960s. All those interactions widened my knowledge and focussed viewpoint. Foort had some innovative approaches. He had readymade stackable AK sockets to be fitted to endoskeletal system in 1969. Further he had insertible metal disc wedges for an individual socket and to foot assembly. We have fought with accommodating stump deformities < 20-25 degrees by inserting wooden wedges. Presently, the knee assembly has a built in arrangement for realignment individually. The original workers have a foresight. In 1995, I visited Biomechnics Lab of Veteran’s Administration in Washington during a world Congress of Physiotherapy. Developing countries are a few years backward in technology. But with middle path quite a many facts can be captured. What can be reached to masses is important for us. We were using force platform, UVR electrogoniometry, a glass walk way, cine-photography (before video cameras) and 4-channel EMG. Now a sophisticated Gait Lab is available at Physiotherapy department. Yet shoes for toddlers that make a beep at heel strike, is pretty effective feedback for a CP child as AD. A postural mirror is simple and effective but can’t be carried. What else can replace a white cane used by the blind? It is used hardly for support; it is for the sensory feel. A strap around shoulders attached to axillary crutch when weak depressors prevents elevation and helps in loading body weight. An additional hand bar to an axillary crutch helps in managing the staircases. Even our peg legs in 1960s with wooden rocker bottom were provided car tyre sole to absob shock. It is the best cheapest waterproof material for shoes for rough and tough use. Stubbies are useful in bilateral AK amputees for home use. In LL orthotics Hyperextension control, Pressure or weight activated knee locking as in Swiss locks is popular. Functional knee joints in weak quadriceps work better, if there is functional power in hip muscles. Rotation could be controlled by straps. Floor Reaction Orthosis is an example of mechanical knee stability indirectly from the distal joint in the link. Wooden sockets carved according to circumference patterns in 1960s presented fitting problems. Physiotherapy Dept. started providing measurements of medial AP and ML diameters, the unchanging characteristics for AK socket, Individually, proposed by Radcliff. This improved socket fitting largely. With quadrilateral socket a measurement jig and a duplicating jig were in vogue. Heidelberg knee in 1960s had hydraulic system connecting knee-ankle motions. Ottobock knee had mechanical self-locking to extension esp. on loading. I was associated with Biomedical engineering field and participated in their first Conference held at HBTI Kanpur through UGC, in 1968. Later, with collaboration of electronic engineers in BARC we developed EMG Biofeedback instruments first time in India since 1970. To convert them as assistive devices did not materialise, being table models. Similarly an electro-goniometer we developed was useful to improve extension lag. Its portability in home-use could be an assistive device. Microprocessor chips were not available. In 1980s, once a BE student developed Integrated EMG processing, at low cost. Finding satisfactory during clinical testing, we desired it for feedback for home use. Contacted after vacation, professor conveyed that product was dismantled after examination! A postural mirror or even a bathroom weighing scale, are useful as feedback device in walking but both stationary like a gym bicycle. But pressure sensors in shoe inserts become AD. During an inter-ministerial national research project for alternate technology on Plastic Lower Limb Orthoses at AIIPMR Mumbai (1985-89) we fitted over 1600 appliances in 20 designs using 10 indigenous plastic materials. Shoe-less orthoses and AFOs without using POP cast, were fitted the same day. Nylon or FRP uprights for metal knee joints, replacement of leather by synthetic materials and use of ovens or even electric stove to cure the materials in hand-made techniques were suitable for CBR. Cork raise was replaced by rigid foam used for fishing nets. Problem of cracks was tackled by heat welding of the mother thermoplastics, a simpler job. Also patten-made AFOs were tried out. Semi-rigid foams moulded around pelvis laterally and attached webbing straps, replaced metal PB. A corrective posterior spinal jacket was developed with adopting Milwauki principle in paralytic scoliosis. Moulded plastic jackets were attached to hip cage with metal joint to facilitate long-sitting in children. This approach was adopted in the country. A prosthetist in 1970s had put up in favour of plastics, “Leather gets dampened by sweat and gets soaked in water, losing the shape. Further cockroaches like it…”! It may be realised that design and the materials are complementary. Anyone may be available, situationally. Immediate post-surgical prosthesis was introduced by Dr Weiss from Poland in early 1963. Ernest Burgess had extensive trials (n=160) in 1964-67, in USA. In mid-1980s our Sr prosthetist Deshpande and Director Dr. Mukherjee carried IPSP fitting at AIIPMR, Mumbai. I prefer POP pylon after drain tube is out and scar is healed that helps relief of oedema and shaping the stump. The challenges always are 1. Stump-socket fit, 2. Knee joint and, 3. Foot. Stump-socket interaction- A total contact suction socket without a gel liner works with a suction valve pretty well, while in sitting and sit-to-stand there is pumping and some air leaks from above. One-way expulsion valves need not to be removed and put again. They expel air during donning making donning easier. Such valve should have a filtering mechanism to be functioning, longer. With gel liner or nylon slip sock made of parachute material, loss of suction is reduced. Seal is created by folding the top end of the gel liner over the socket. During donning, stump-muscles contraction is advised and also during sitting or standing up. 2. A polycentric knee with four / six-bar linkages for stance-phase stability, with swing-phase initiation, damped knee swing-phase control and foot clearance, are the issues. Microprocessor controlled knee seems to be the theme for bionic ‘inteligent limb’ (IQ not mentioned!). A gyroscope/ accelerometer sense the angle and speed of the movement. With dynamic mobility smooth natural motion and negotiation of slopes, climbing stairs foot-over-foot are achieved. 3. Energy storage and release by prosthetic foot have led to bionic foot. We find in BK prostheses hard sockets work well but soft inserts improve performance in the long run. There are no callosities on stump. PTB /PTS fittings work well. In case of skin problems (scars, skin graft, sensory loss) soft sockets are mandatory. Occasionally a slip socket with conventional BK prosthesis with knee joint is the remedy. Short BK stump may need a step-up knee joint unless flexed and an end-weight-bearing knee disarticulation type prosthesis is fitted with patient consent. For Syme’s prosthesis a suitable foot is available. 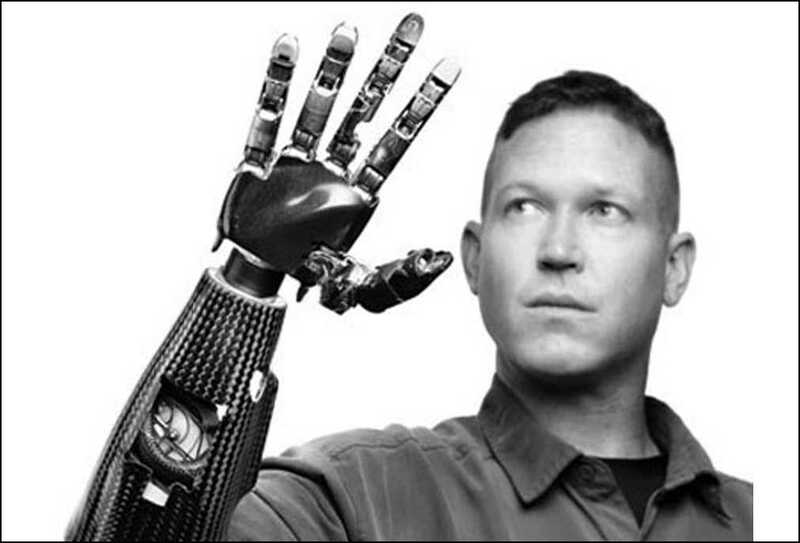 In prosthetic hand, individually-powered digits, is the trend to achieve variety of functions. It seems, from mechanical design there is tendency towards software designing. With brain-computer interfaces electrical signals of the nerves or muscles in the intact limb would enable to read the user's intent. Implantable EMG sensor is in offing. Robotic devices have entered in orthotics but costs are very high. Neurophysiological influences on gait: Gait is programmed yet it has individuality like a signature. Posture or the Gait deviations are adopted by the body system without conscious effort to remain functional. They are energy-efficient. We stamp them ‘deviations’. Some natural strategies are useful. During training for gait symmetry in step-distance and timing, the energy efficiency must be maintained. Plasticity of CNS during learning builds structural changes in networks of CNS, as evident by fMRI. Deviations are not blessings in disguise too. They cause secondary complications like pain and deformities in the linked articulations. Some deformities are due to developmental persistence in children e.g. flat feet in CP. Secondary scoliosis (a new C in opposite direction of primary C ), is compensatory. Whether and What is to be corrected must be decided. TA/ hamstrings mild contractures/ spasticity assist in knee stability with quadriceps weakness. In spastic muscles of UL/LL cooling pads can be used selectively as home devices since spasticity is reduced temporarily but active movement being unaffected, strengthening is practiced; a temporary orthoses can be tried to judge function. Assistive devices are patient-centred and in self-care/ self-help devices, readymade as wellas the custom-made approaches are in vogue, subject to affordability. Orthotic appliances for congenital deformities. Dr Sant Father of Medical Rehabilitation in India regarded that fitting appliances and training be carried out than early surgery in phocomelia. Sometimes syndactyly or a bud comes in way warranting surgery. A CTEV foot is corrected early today. Earlier, a child with club feet could walk. Whether shape of an elephant shoe could be made cosmetic is another issue. But amputation is different strategy for which a child is not in consenting age. We have fitted extension orthoses in phocomelia of femur; anatomical foot remains weight bearing; with SACH foot there is appearance of a foot below foot. Boys have to use a loose bottom trouser. Shri Mirajkar had exceptional skill in fitting appliances in congenital deformities. Some preferred rotation osteotomy and walked with extension orthoses, more cosmetic. Wheelchair with removable arm rests facilitates transfers while in quadriplegia high back rest arrangement and trunk fixing corset are needed. A rod to fix arm sling(s), is helpful. Fixing a board in front to an arm rest, helps placement of for lunch plate and to do other jobs. Standing facility is provided in some to eliminate need of a tilt table. Special exercise equipment like self-traction, therabands, pulleys, biofeedback, inhalers, therapeutic balls also are AD. Even C and E heels are exercisers for intrinsic muscles of feet while Arch supports relieve pain in falling arches. In sports shoes they protect from sudden high strains. Similarly specialized chairs, desks for CP children are known. There are therapeutic toys. Ergonomic chairs in backache are popular. AD technology devices for access to information: Speech recognition software, Screen reading software, academic software packages for students with disabilities. But Availability, Affordability, Operability, Dependability/Reliability must be weighed. For activities a reacher with hook grasp is handy. For writing: Build-up pen or pencil holder. This article won’t be complete without paying tributes to two stalwarts from India. I quote from Ind. J Orthopaedics obituary: Dr P K Sethi (2008 April-June). He set out to solve the rural patients' need for a foot piece that would look like a bare foot, would be waterproof and durable and flexible enough to allow for ease of walking over uneven ground and for its wearer to squat and sit cross-legged. Regarding Jaipur foot Dr Sethi mentioned skills of Ram Chandra, a master craftsman whom Dr. Sethi affectionately referred to as “Masterji”. Final product had flexibility and resilience, simulated subtalar, ankle, and torsional movement and it was durable. His paper in 1970 at British Orthopaedic Association at Oxford, received a standing ovation. He was conferred Padma Shri in 1981, Ramon Magsaysay Award, Manila (1981). He also worked on carbon fiber composites for fabricating light-weight calipers along with Prof Lakkad of IIT Mumbai. Prabhoo Ram wrote in Indian J Orthop [serial online] 2009, “Dr. Brij Bhushan Joshi is indeed a legend. He has been acclaimed as a “Pioneer in Hand Surgery”. He discovered early that even the best surgery must be supplemented with effective splints and exercises. He devised economic and effective splints made from wire, aluminium strips, plastic tubes, felt, buttons and rubber bands, often bought in bulk from the junk market!... across the globe hand surgeons accepted Dr. Joshi's ideas wholeheartedly” in 1974. We at AIIPMR, Mumbai were lucky to have his interaction as a visiting faculty since 1970s while he was with MGM State Insurance Hospital. To sum up ADs are numerous. We have discussed those for personal use. Readymade products cost less against the custom-made. Low-cost prostheses, needs research. User perceptions count and outcome measures like quality of life are also getting employed. However, the field is challenging. It invokes creativity by the scientists, technologists as well as the therapeutic personnel. P&O and other engineering personnel should adopt approach of human sciences progressively.